Looking at our itinerary, I wanna skip the biggest python sana dahil, ewan ko, 'di ko trip tumingin ng ahas. Pero I'm not scared either. But just for the heck of it, sige go na! Kuya tatsky briefed us a little about the python. And then he asked if we've seen a talking kangaroo, and we're like, "Huh?!". We entered an uphill rough road. It's like a typical barrio in your hometown province. When we reached the place, we saw a lot of tourists visiting the place. 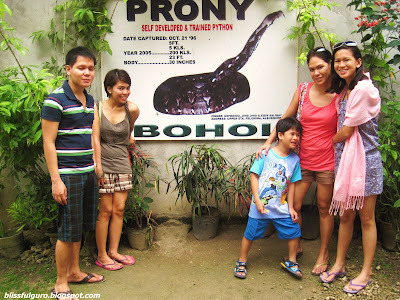 Meet Prony, the 250-kilo, 26 ft. and 30 in. 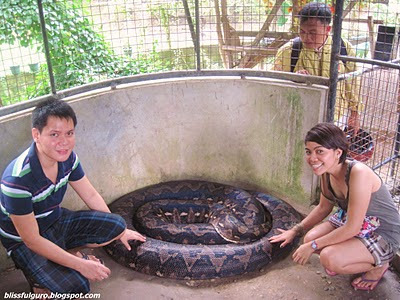 in circumference python and noted as the biggest in the Philippines (and the world?!). 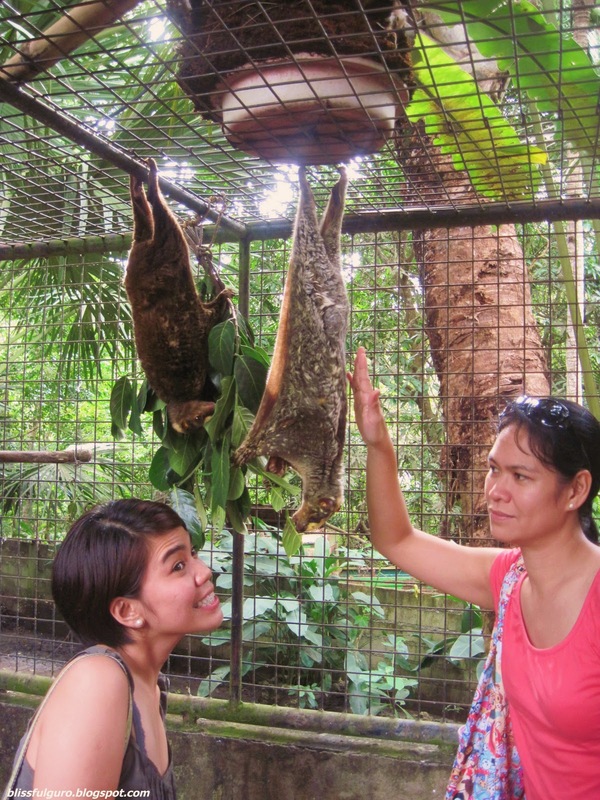 You have to pay 10 pesos when you enter the house-turned-into-a-mini-zoo. At that point, you will be greeted by Marimar. The (in)famous nephew(niece?) of Mang Sifronio. Marimar will tell you the story of how Prony was captured on October 21, 1996 and how she (yes, babae c Prony) was named after her capturer. She was then 5 feet and 5 kilos. She has a defect 'coz her growth is abnormal. And she can be compared to a 40-year old pythons although she is just 14-year old. Pythons can live up to 100 years. So here's the star of the trip, Marimar (kuya tatsky's "talking kangaroo" haha). After his speech about Prony he will show you a dried snake's skin which he turned into a swim wear. He wore it in a gay beauty pageant in which he won as the 2nd place winner (there were only 3 contestants.haha). He also told us that unlike Prony, he's only eating fish and vegetables. If there were foreigners, he can do his speech in their language; French, German, Korean, Spanish, etc. 20 languages as of Feb. 2011. Nice and witty. After that, kuya tatsky signaled Marimar to do "the show". I really don't know what to expect at that point. 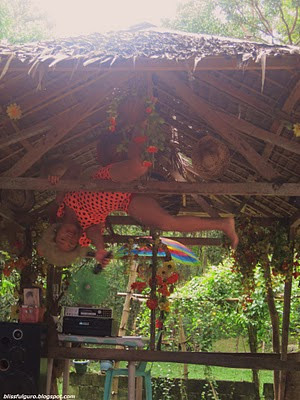 Marimar ushered us to the "V.I.P. seats", it's a long wooden bench in front of the bahay-kubo-like stage. I felt really privileged because of the people's reverence to kuya tatsky in all of the spots we went to. They really know him. 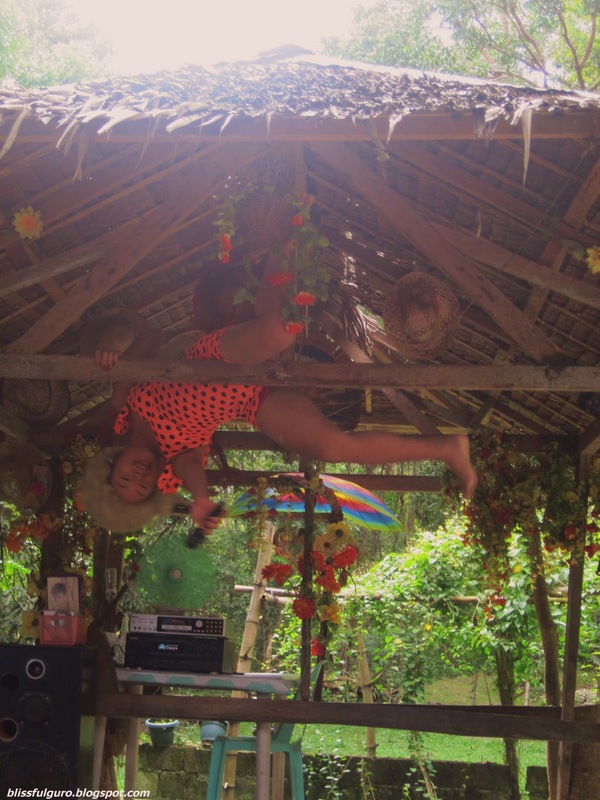 And we didn't see Marimar doing the show with other tourists. Only when kuya signaled him to do it. Batas si kuya! haha. The show is a comedy-bar-like with cirque-du-soleil-like moves. It was really funny and entertaining as well. How he perfected the lip synching parts was amazing. He owned the stage and that moment. Everyone's eyes were fixed on his performance. The most remarkable is the "It's Raining Men" part. After the performance, everyone was shouting for "More! ", but he looks very tired after climbing those posts. 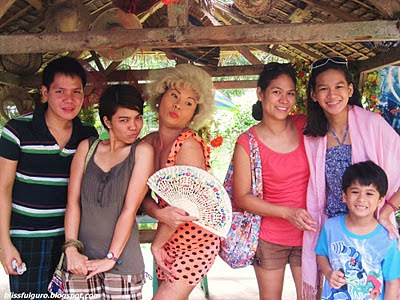 We, of course, wouldn't want to leave without having a photo taken with Marimar. He made it very memorable for all of us.